THAT IS A F*CKING MASTER. I F*CKING LOVE HER. It put me in mind of a professional development workshop I attended 2 years ago which was run by Lucy West. Both Ball and West displayed a level of adeptness at getting students to engage with one another’s reasoning that blew me away. One trick both of them used was to consistently ask students to summarize one another’s train of thought. This set up a classroom norm that you are expected to follow and be able to recapitulate the last thoughts that were said, no matter who they are coming from. Both Ball and West explicitly articulated this norm as well as implicitly backing it up by asking students (or in West’s case, teachers in a professional development setting) to do it all the time. In both cases, the effect was immediate and powerful: everybody was paying attention to everybody else. The benefit wasn’t just from a management standpoint. There’s something both very democratic and very mathematically sound about this. In the first place, it says that everybody’s thoughts matter. In the second, it says that reasoning is the heart of what we’re doing here. I resolve to start employing this technique whenever I have classroom opportunities. I know that it’ll come out choppy at first, but I’ve seen the payoff and it’s worth it. A nuance of the technique is to distinguish summarizing from evaluating. In the Ball video, the first student to summarize what another student said also wanted to say why he thought it was wrong; Ball intercepted this and kept him focused on articulating the reasoning, saving the evaluation step until after the original train of thought had been clearly explicated. Which brings me to a second beautiful thing she did. What fraction of the big rectangle is blue? 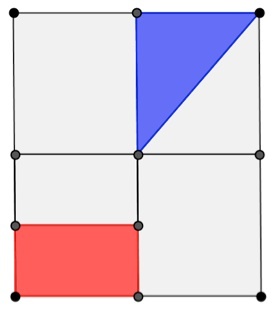 The first student to speak argued that the blue triangle represents half because there are two equal wholes in the little rectangle at the top right. He is, of course, wrong. On the other hand, he is also, of course, onto something. (b) clarified that he missed something key. Ball: Who can summarize what [Kid A] said? Ball: It’s not time to say what you think of his reasoning yet, first we have to understand what he said. Kid C: He’s saying that the little rectangle has 2 equal parts and the blue is one of them. Ball [to Kid A]: Is that what you’re saying? Ball: So, what was the whole you were looking at? Ball: And what were the two parts? Ball: And are they equal? Ball [to the rest of the class]: So if this is the whole [pointing at the smaller rectangle Kid A highlighted], is he right that it’s 1/2? Ball: The question was asking something a little different from that. Who can say what the whole in the question was? I loved this. This is how you do it! Right reasoning has been brought to the fore, wrong reasoning has been brought to the fore, nobody feels dumb, and the class stays focused on trying to understand, which is what matters anyway. Also a propos is this recent opinion piece in the NYT by Ta-Nehisi Coates. Full disclosure: the author of the book is my dad. The high school featured in the book is the one I both attended and taught at. This is a beautiful book. The author is a (white, Jewish) professor of philosophy at a university. The book chronicles his venture into teaching a class about race and racism at his local racially diverse public high school. It offers a model of what a functioning, productive cross-race conversation about race and racism can look like, in an era where (depressingly) this is still a rarity. It makes a case for the civic value of integrated public education in an era where we seem to be forgetting that education even has a civic purpose. (2) The genre is characterized by taking students seriously as moral and psychological beings. That’s one of its strengths as a genre as a whole. But this is the first book I’ve read that takes students equally seriously as intellects. The author often writes with plain admiration for his students’ ideas. This may be my favorite feature of all. Developing students as minds is, after all, the point of education. So it strikes me as surprising that it’s so rare for a memoir about the lived experience of teaching to give such loving attention to what those minds produce. It was kind of a fight! Since I and Wikipedia agreed on this point (it’s not prime), J acknowledged we must know something he didn’t. But regardless, he kind of wasn’t having it. Point 1: This is awesome. Nothing could be better mathematician training than a fight about math. Proofs are called “arguments” for a reason. and the other kids had that same sort of feeling like, “he knows something we don’t know,” but they weren’t convinced, and with only a minimal amount coaxing, they weren’t shy about it. The resulting conversation was the stuff of real growth: everybody in the room was contending with, and thereby pushing, the limits of their understanding. Even the boy who “knew the right answer” began to realize he didn’t have the whole story, as he found himself struggling to be articulate in the face of his classmates’ doubt. Now this could have gone a completely different way. It’s common for “0.999… = 1” to be treated as a fact and the above as a proof. Similarly, since the Wikipedia entry on prime numbers says, “… a natural number greater than 1 that has no positive divisors…,” we could just leave it at that. But in both situations, this would be to dishonor everyone’s dissatisfaction. It is so vital that we honor it. Everybody, school-aged through grown-up, is constantly walking away from math thinking “I don’t get it.” This is a useless perspective. Never let them say they don’t get it. What they should be thinking is that they don’t buy it. And they shouldn’t! If it wasn’t already clear that I think the above “proof” that 0.999…=1 is bullsh*t, let me make it clear. I think that argument, presented as proof, is dishonest. If you smell a rat, good! My point is that that same rat is smelling up the other proof too. We need to have some respect for kids’ minds when they look funny at you when you tell them 0.999…=1. They should be looking at you funny! Same thing with why 1 is not a prime. If a student feels like 1 should be prime, that deserves some frickin respect! Because they are behaving like a mathematician! Definitions don’t get dropped down from the sky; they take their form by mathematicians arguing about them. And they get tweaked as our understanding evolves. People were still arguing about whether 1 was prime as late as the 19th century. Today, no number theorist thinks 1 is prime; however, in the 20th century we discovered a connection between primes and valuations, which has led to the idea in algebraic number theory that in addition to the ordinary primes there is an “infinite” prime, corresponding to the ordinary absolute value just as each ordinary prime corresponds to a p-adic absolute value. Now for goodness sakes, I hope you don’t buy this! With study, I have gained some sense of the utility of the idea, but I’m not entirely sold myself. To summarize, point 2: Change “I don’t get it” to “I don’t buy it”. Now I think this change is a good idea for everyone learning mathematics, at any level but especially in school, and I think we should teach kids to change their thinking in this way regardless of what they’re working on. But there is something special to me about these two questions (is 0.999…=1? Is 1 prime?) that bring this idea to the foreground. They’re like custom-made to start a fight. If you raise these questions with students and you are intellectually honest with them and encourage them to be honest with you, you are guaranteed to find that many of them will not buy the “right answers.” What is special about these questions? I think it’s that the “right answers” are determined by considerations that are coming from parts of math way beyond the level where the conversation is happening. As noted above, the “full story” on 0.999…=1, in fact, the full story on the left side even having meaning, involves real analysis. We tend to slip infinite decimals sideways into the grade-school/middle-school curriculum without comment, kind of like, “oh, you know, kids, 0.3333…. is just like 0.3 or 0.33 but with more 3’s!” Students are uncomfortable with this, but we just squoosh their discomfort by ignoring it and acting perfectly comfortable ourselves, and eventually they get used to the idea and forget that they were ever uncomfortable. Meanwhile, the full story on whether 1 is prime involves the full story on what a prime is. As above, that’s a story that even at the level of PhD study I don’t feel I fully have yet. The more I learn the more convinced I am that it would be wrong to say 1 is prime; but the learning is the point. If you tell them “a prime is a number whose only divisors are 1 and itself,” well, then, 1 is prime! Changing the definition to “exactly 2 factors” can feel like a contrivance to kick out 1 unfairly. It’s not until you get into heavier stuff (e.g. if 1 is prime, then prime factorizations aren’t unique) that it begins to feel wrong to lump 1 in with the others. I highlight this because it means that trying to wrap up these questions with pat answers, like the phony proof above that 0.999…=1, is dishonest. Serious questions are being swept under the rug. The flip side is that really honoring students’ dissatisfaction is a way into this heavier stuff! It’s a win-win. I would love to have a big catalogue of questions like these: 3- to 6-word questions you could pose at the K-8 level but you still feel like you’re learning something about in grad school. Got any more for me? All this puts me in mind of a beautiful 15-minute digression I witnessed about 2 years ago in the middle of Jesse Johnson’s class regarding the question is zero even or odd? It wasn’t on the lesson plan, but when it came up, Jesse gave it the full floor, and let me tell you it was gorgeous. A lot of kids wanted the answer to be that 0 is neither even nor odd; but a handful of kids, led by a particularly intrepid, diminutive boy, grew convinced that it is even. Watching him struggle to form his thoughts into an articulate point for others, and watching them contend with those thoughts, was like watching brains grow bigger visibly in real time. Honor your dissatisfaction. Honor their dissatisfaction. Math was made for an honest fight.